Haning height adjustable up to 120 in. Polished chrome branches with crystal leaves attached. Adjustable height from 8 foot chain. Hang semi flushmount or longer to fit. Fixture attaches to matching decorative ceiling plate and is suitable for vaulted ceilings. Halogen bulb(s) included with hardware and installation instructions. Richly accented crystal is braided and diamond cut and lush with glimmering beads. Single tier chandelier includes matching 8 foot chain for height adjustments. Fixture attaches to matching decorative ceiling plate and is suitable for vaulted ceilings. Polished chrome branches with crystal leaves attached. Adjustable height from 8 foot chain. Hang semi flushmount or longer to fit. Multi-directional bulb placement for all around room lighting. Halogen bulb(s) included with hardware and installation instructions. Striking glass crystals cascade over a silver pearl finish on the Veranda 8-Light Traditional Silver Pearl Incandescent Chandelier from Glow Lighting, creating a lavish touch of luxury. The glass crystals reflect incandescent light to display dazzling colours while warming the ambiance of any home. Perfect for entryways and dining rooms, the fixture offers an adjustable hanging length for custom placement. 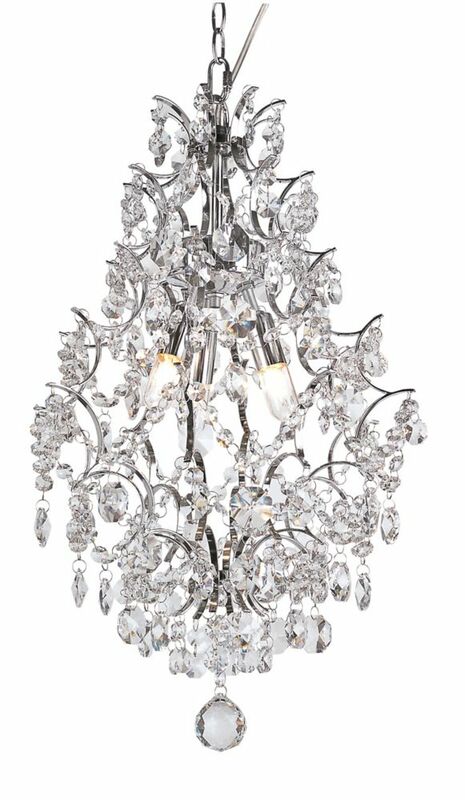 3 Light Crystal Teardrop Chandelier Elegant chandelier lighting is always in style with million cut crystals that sparkle and shine. Polished chrome branches reach out with dangling strands while this open frame fixture uses multi-direction placed halogen bulbs for an all-over glow from within. Finished with a diamond cut crystal sphere on the bottom and polished chrome trim.